We’d love your help. Let us know what’s wrong with this preview of Tiger's Secret Desire by Julye Evans. Chris finds Tamsin and tells her he's there to rescue her. She thinks he has got to be kidding. But a series of suspicious disappearances and violent incidents leads her to believe someone is out to get her. To ask other readers questions about Tiger's Secret Desire, please sign up. She’s close to finding a cure to a rare shifter disease so Tamsin won’t let anyone or anything get in her way when an unbelievable career opportunity comes her way. He loves to get under her skin and Chris intends to rescue her even though she doesn’t know she’s been kidnapped. Readers can’t help but get caught up in the thrills and excitement of this romance as these strong, compelling characters work together to solve the mystery of some suspicious disappearances and violent incidents. The rom She’s close to finding a cure to a rare shifter disease so Tamsin won’t let anyone or anything get in her way when an unbelievable career opportunity comes her way. He loves to get under her skin and Chris intends to rescue her even though she doesn’t know she’s been kidnapped. Readers can’t help but get caught up in the thrills and excitement of this romance as these strong, compelling characters work together to solve the mystery of some suspicious disappearances and violent incidents. The romance between these two have a major obstacle that stands between them because Tamsin has a secret, one that she refuses to share which causes some emotional turmoil but the chemistry sizzles with lots of undeniable heat that makes hard for either of them to focus. I voluntarily reviewed a copy of "TIGER'S SECRET DESIRE" This is absolutely a must have series this storyline is captivating, interesting, entertaining, intriguing, full of intense drama and suspense with a few twists that have you turning page after page. Tamsin Carter is a scientist working on a project to cure, a disease that prevents shifters from fully shifting she also works at her twin sister Anjanae's bar Ice House where all the Nightfair Crew go. Chris works for Nightfair Crew and has kn I voluntarily reviewed a copy of "TIGER'S SECRET DESIRE" This is absolutely a must have series this storyline is captivating, interesting, entertaining, intriguing, full of intense drama and suspense with a few twists that have you turning page after page. Chris works for Nightfair Crew and has known for awhile that Tamsin is his mate but she's all about her project that's her priority not a social life she has to find a cure but he won't give up on her. Tamsin sends an email to her sister Anjanae to let her know she's ok but will not be able to be reached for awhile which causes her sister concern she gets Nightfair Crew to go find and rescue her. The story has a few twists when Nightfair goes to rescue Tamsin she's in a facility like a prison which causes Chris to be worried about her safety this is a must have read you don't want to miss I definitely recommend. Tiger's Secret Desire by Julye Evans is the latest addition to the Nightfair Shifters and it does not disappoint. Containing intrigue and romance, Tiger's Secret Desire fits perfectly into the paranormal romantic suspense read that I like to read. The author brings strong characters together, weaving a story that moves quickly and smoothly. The chemistry between the two main characters kept me turning the pages until the very end! Tamsin is a panther shifter and scientist and she's taken a drea Tiger's Secret Desire by Julye Evans is the latest addition to the Nightfair Shifters and it does not disappoint. Containing intrigue and romance, Tiger's Secret Desire fits perfectly into the paranormal romantic suspense read that I like to read. Tamsin is a panther shifter and scientist and she's taken a dream job that will allow her to work on her life long project. Leaving a note for her sister saying she has a job and will be out of touch, she relocates to the research facility. Chris, a tiger shifter and security specialist, is a member of the Nightfair Shifters organization. He's known and flirted with Tamsin for years. When her sister asks for help to find her, he soon finds out there's more going on than a research facility. The HEA does not overpower, leaving the story to stand on its own. Thank you Ms Evans. I give your book five stars and look forward to reading more about the Nightfair shifters. Fights and anger was this foreplay for a number of years ago leading to a mating? Or was this just a physical attraction neither wanted to give into because they didn't believe it was leading anywhere but the here and now? This just a random thought that may or may not be answered right away. Tamsin character is a twin that is more recluse and single minded where her scientific brain can gets here into trouble without meaning to. She can feel her panther but doesn't always listen to her which can lead to more trouble than necessary. Chris is a tiger shifter that is a member of the Night fair group that handle cases that the human community cannot know about. He enjoys irritating other on his team just for the fun of it. They also give back as good as they get it. When I first started reading the story I was not sure how well I was going to like these characters but the author made them for for their story. Each liked having their own way so they weren't always interested in listening to the other. Chris O’Neill, Nightfair Company operative, has known from the start that Tamsin is his mate, and his tiger agrees. Desperate to rescue Tamsin from danger, Chris infiltrates the building where Tamsin is being held captive. But all is not as it seems, as Tamsin is adamant that she is NOT being held captive, that she is there of her own free will, and can leave whenever she wants. Chris and Tamsin find themselves embroiled in a situation that will require all of Chris’s mercenary skills to escape. Tamsin is fighting the urge to climb Chris like a tree as both feel the bond growing between them, and to keep her findings from falling into the wrong hands, wreaking havoc in the shifters worldwide. Tamsin has been seeking a cure for her secret problem but a new job is not what it seems. Seeking a cure for her secret problem has ruled Tamsin's life but the new research job is not what it seems and she feels watched plus someone has been in her lab. Tiger shifter Chris is one of a group sent to free Tamsin who he think is his mate. Going undercover as a janitor he manages to find her and finds that she thinks it is a job rather than a prison but she finds that wherever she goes she has guards Tamsin has been seeking a cure for her secret problem but a new job is not what it seems. Seeking a cure for her secret problem has ruled Tamsin's life but the new research job is not what it seems and she feels watched plus someone has been in her lab. Tiger shifter Chris is one of a group sent to free Tamsin who he think is his mate. Going undercover as a janitor he manages to find her and finds that she thinks it is a job rather than a prison but she finds that wherever she goes she has guards following her. When she overhears something that makes her thinks they have taken some of he unfinished and untested cure and are using on unwilling shifters she know she must spoil the data she leaves behind and escape. A Shifter romance to relax and enjoy. Tamsin is a panther shifter and when she gets the chance at a great job she takes it. This job means she can work on a project that she has wanted for years. When her sister worries about her she sends someone in to rescue her. Although Tamsin doesn't know it at the time She does end up needing Chris's help. Things heated up between them and its seems like everything clicks between them. However Tamsin has a secret that she hasn't shared with him and it could ends things before they even get a c Tamsin is a panther shifter and when she gets the chance at a great job she takes it. This job means she can work on a project that she has wanted for years. When her sister worries about her she sends someone in to rescue her. Although Tamsin doesn't know it at the time She does end up needing Chris's help. Things heated up between them and its seems like everything clicks between them. However Tamsin has a secret that she hasn't shared with him and it could ends things before they even get a chance. Will Chris leave once he learns her secret? Will her research finally work? This is a great story and will have you on the edge of your seat from the beginning to end. The chemistry between them is off the charts hot. This is a well written and very entertaining story. I would recommend this book to any book lover. Easy to read, intense, humorous and detailed good read. Even though a series, this book is definitely a standalone. Ms. Evans gave more to concentrate on as you continue to read through the book. There are a lot of things that needed to be explained as the heroine, a chemist and the hero, an alpha of an elite group come together.I enjoyed how she had the conflict between the characters evolve if only come together. It’s enjoyable to have the main characters, Tamsin and Chris two strongly built s Easy to read, intense, humorous and detailed good read. Even though a series, this book is definitely a standalone. Ms. Evans gave more to concentrate on as you continue to read through the book. There are a lot of things that needed to be explained as the heroine, a chemist and the hero, an alpha of an elite group come together.I enjoyed how she had the conflict between the characters evolve if only come together. It’s enjoyable to have the main characters, Tamsin and Chris two strongly built shapeshifter‘s trying to find their way together to make their lives work. Of course, the insecurities of one doesn’t deter the other to stop the pursuit of having a HEA. Tamsin, a panther shifter that cannot shot and scientist, has been talking with Chris, a tiger shifter and security specialist, for awhile now and will not let it go any further. As the story progresses hidden dangers come to light, what was supposed to help was used to hurt, and turning on each other may cost them everything. 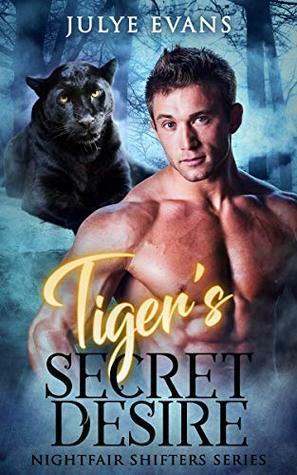 This latest addition to the Nightfair Shifters does not disappoint, containing intrigue and romance Tiger's Secret Desire fits perfectly into the paranormal romantic suspense read that I like to read. In the 4th to the "Nightfair Shifters" series, Tamsin, a panther shifter, is known for her seriousness when it comes to research. Especially she is trying to find a cure for a shifter disease whenever she can find the time for it.Chris has been flirting with her but realises only after Tamsin has been missing for a while that she might be more to him than just a beautiful face. With the help of his friends he tries everything to keep her safe. Well-written and entertaining, it holds up the standar In the 4th to the "Nightfair Shifters" series, Tamsin, a panther shifter, is known for her seriousness when it comes to research. Especially she is trying to find a cure for a shifter disease whenever she can find the time for it.Chris has been flirting with her but realises only after Tamsin has been missing for a while that she might be more to him than just a beautiful face. Well-written and entertaining, it holds up the standard of the previous books. It was a good mix of casual and thrill to while the time away. He's here to rescue her. Only problem is she doesn't need rescuing, right? She's a kick a$$ woman with a bad a$$ kitty inside her. Someone comes and messes with her and she'll show them what she can do with her claws - and a frying pan! And someone had better tell Chris to think before his gob gets in even more trouble.....whoops too late. And what is that noise? I absolutely loved this book - that's not surprising. But what is surprising is the ending! What a fantastic read! Chris is the perfect, gorgeous alpha male who would do anything for his mate. But he is a guy, so there will be bumps in the road as his mouth gets in the way of his heart. Of course, Tamsin doesn’t give him all of the facts so he’s working at a slight disadvantage. I love that these two manage to get their act together and find their HEA. I can’t wait to read the next book in the series. Tamsin is a research scientist close to finding a cure for a rare shifter disease. Her sister tells Chris she is missing - and Chris finds her in danger. Will he and his friends be able to save her? And what is happening between them? He feels like she is his mate, and he wont give up! She is attracted to him too - but is worried that she isnt good enough for him. Can they work it our? Loved it! This was a good story. I enjoyed the way it started out, but the heroine let her condition cause way too much self doubt and didnt realize until close to the of the book. And she just kept some of the important things about what she was doing hidden for too long which just dragged the story out in certain chapters. It was a good story ...just didnt really heroine. Tiger's Secret Desire: Nightfair Shifters, a BWWM Romance by Julye Evans is an awesome story to read. This is book number four in this awesome series that I have really loved reading about a tiger shifter and a panther shifter. I highly recommend this to everyone who loves reading about tiger and panther shifters. Great story!! Chris and Tamsin were a very interesting couple. When they both realized what was in their face the whole time the story got even hotter. Lots of interaction with previous book characters and just everyone else in this world created by the author. Still trying to figure out the rogue shifter mystery, so it looks like more answers to come in the next book. I really enjoyed this one. This book was incredible! I cannot wait to see what the author has in store in the future. The plot was so well developed and the characters are so mismatched it works. I loved the way the author drags you into the story and how it develops around you. I recommend this book. Tamsin and Chris were great together. Tamsin does research and is trying to perfect her formula for something dear to her. Tamsin's sister asks Nightfair to find her sister who she thinks is missing. It had the perfect mix of action, mystery and romance. This book was a great addition to the series and I loved seeing the Nightfair crew back together. Smooth flowing story with great characters. Fast paced and action packed, Tamsin and Chris have a real connection that you can feel as they fight to untangle a mystery. Fun story, likable characters and a detailed storyline that puts you right in the middle of the action. (I voluntarily reviewed an ARC). I received a free copy of this book via Booksprout and am voluntarily leaving a review. Book four in the Nightfair Shifters, a BWWM Romance series a well written story that had me laughing. This is Research scientist Tamsin Carter who has a rare shifter disease and tiger shifter and Nightfair mercenary Chris O'Neal's story. I want to read the next book. This is the first book by this author that I've read. I liked it, the characters were interesting and the plot held my interest. I requested and was given a copy thru the author Julye Evans and this is my voluntary review. Tamsin and Chris's story was really good. Kept me interested from start to end. Alot of action and suspense. Also includes alot of steamy hot scenes, so not for the stuck up prude! Really looking forward to following this series and finding out what happens next. I thoroughly enjoyed the pace and action of the story. There were plenty interactions that could have your scratching your head. which made sense as you moved through the book. I look forward to more from this author. I enjoyed this new "Nightfair Shifters" story! It's well written with some great characters. I love Tamsin and Chris! The chemistry and passion are off the charts. I love the dynamics of the story! It's a very captivating with an edge of your seat plot. The storyline was well written and the characters were so well detailed that as I turned each and every page I felt like Chris and Tamsin jumped from the pages and pulled me right into their story as it unfolded! The chemistry between these two kept me turning the pages until the very end! Very well written story. The character fit so well with the storyline it seems real and keeps your attention. It is exciting, emotional, dramatic and much more. It is highly recommended and a very enjoyable read. Good author. I voluntarily review a copy of this.